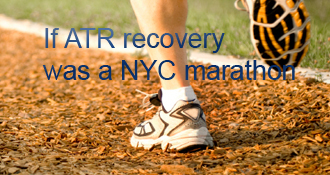 jeffk58 has completed the grueling 26.2 ATR miles to full recovery! Well, it has now been exactly one year since my ATR surgery. For the most part, the “one year recovery” theme has held true for me, and I feel very fortunate for my recovery. I can now do everything I could do before my ATR, including cycling, tennis and skiing (even with a bad snow year, got 20 days in….) and the minor reminders of the injury have begun to recede. For those folks in the early days of your recovery (when time seems to grind to a halt), in the end things go very fast - especially once you start PT and work your way back to health! Thanks Dennis for setting up this site and to all of those of you that encouraged me along the way - it made me a smarter patient and made the recovery a lot less lonesome. That said, my wife did get a little sick of me talking about all my “ATR friends”! Best of luck to all of you for successful recoveries! Just finished up my final PT Appoinment and got the “green light” to return to full activity including the scene of the crime - playing tennis! While the early days of NWB and PWB crawled by, the last 4 months have gone by quickly as I have been able to return to most activities. Since being cleared in September for most sports, I have been able to ride my road bike, hike and ski without pain. Have already logged 6 days on the ski hill and, other than some pain at the incision site, pretty much a return to normal. Only strange thing pointed out by my PT, I have been so focused on rehabbing my injured leg, my injured calf is now stronger and bigger than my non-injured calf. Guess I have to remember my other leg!! For me, I think cycling was the key to my recovery. I was cleared to ride my road bike at month3, and have logged over 1,000 miles since. Not only was it good for my outlook, it really helped my range of motion. So - now off to the final frontier of the tennis court! Happy healing everyone - in the end, it all goes prtty fast. - I am riding my road bike about 100 miles per week. I can now ride hills and am beginning to be able to stand up in the pedals. -I have been given the green light to start light jogging. I am running about 2 miles, alternating every 5 minutes or so between jogging and walking. The only nagging reminders are stiffness in the ankle in the morning and after sitting too long, and a very tender area next to the incision. According to my OS, this is either scar tissue or a stich that is causing irritation. The PT is working on it with a Gastron tool (which hurts like hell….) but seems to be making it better. I am keeping a close eye on it nonetheless, as it is the most persistent reminder of my injury. Played 54 holes of golf last week with family back East - had fun and did not re-injure my AT. Comfortably walking about 15,000 steps a day. Swelling and limp starting to go away. I have found KT Tape to be very helpful. With the help of my PT, calf strength is returning. Can now do a “partial” single heel raise. Got clearance from PT to start road biking - even using my clip-ins! Went for my first ride today - kept it at 12 miles but it felt great to be back on the bike. So, generally happy where I am. Those initial dark days when I thought my summer was lost are beginning to fade. For those of you in the early stages, there is a light at the end of the tunnel!! Well, I am taking my injured AT on its first vacation - visiting family on the East Coast. Jumped in the LI Sound, climbed up a ladder to get out of the water, and followed it up with 9 holes of golf - with a very abbreviated swing. A little swollen at the end of the day, but still in one piece! Hope I can continue! Almost 10 weeks and things are generally going well - although progrees is certainly very incremental. Can walk about a mile without a limp (but with limited push-off) and am riding the stationary bike without the boot. Starting double heel raises and other strengthening/balance exercises. I feel very fortunate so far, as swelling has been limited. Question - I am going on vacation next week to visit family, and one of the main activities with my Dad and brothers is the game of golf. Met with my PT this morning, and he thought I would be fine (even with no boot). Anyone sucessfully tried golfing in and around the 10 week mark? While you have been a good friend these last six weeks, it is time we spend some time apart. So, I now begin my transition to two shoes! Starting today, I am beginning the process of walking without the boot. With a small heel lift in my left shoe, I am able to walk fairly comfortably. I was only going to go without the boot this morning, but am now going into the afternoon! Started PT as well, so the next phase begins. The Vacocast will remain close at hand for all crowded places - like tonigt’s Portland Timbers game, where crowds and stairs would otherwise scare my fragile AT! So, despite all the great advice from Norm, David and others, I did not get an even-up right away, and instead tried to make do with a hiking boot.With the Vaco and the achilles sole, there was still at least a 1/2″ difference. Finally went for it and ordered the even-up, as my right hip was beginning to hurt. What a difference! It has improved my gait immensley and hip pain is gone. For those of you getting ready to move to FWB, it is well worth the $27.00. It is goofy looking, but it works! It Ain’t Pretty, but Who Cares? So, I got to switch to 10′ in the Vacocast last night. Up until then, I was putting weight on it, crutch-walking and doing some shuffling, but nothing that I would call walking. Today was the big day. Put a big old hiking boot on my good foot to even things up (looking real cool at work now, shorts and a dirty hiking boot), and hot damn, I am a walking! Not too smooth yet, but I am heeding Norm’s sage advice on how to do it correctly. All in all, a good morning! Thanks for your post, and congrats on moving forward! I am 30 days post-op and agree already that this site is a great resource. I’ve learned a lot from the folks ahead of me in recovery, and appreciate your taking the time to provide some encouragement. I’ll do my best to pay it forward 11 months from now, as well! Hi JeffK – Your “4 Months/Spinning Along” was one of the first blogs I read when I had my surgery at the end of August. It was one I re-read from time to time because it was inspirational and something I could look forward to. I just passed 4 months and glad to be at similar stage in recovery. Good to hear you are doing well and are near the end of your journey. I will be re-reading your “8 Month/Final PT” update in the coming months. I agree with Kim’s comment, it is incredible to have a larger calf after all your hard work. Good luck and Congrats! Jeff - You are the first poster I can recall who has reported an injured calf now larger than the other one! Way to go after that rehab!Good luck to you as you get back on the tennis court! David - I am going up with both legs and then down on my injured leg. I am also doing some single leg raises with my injured leg, but can only do about 5-10 reps at most. Just had a fun session with my PT. A lot of balance and agility drills on the ladder - including some jumping! All a bit scary - but I have learned to really trust him. Chris - others describe it better, but you place your injured foot on the stair tread with about one-half hanging off. That way, you are not stressing your AT as you step down with your good leg. I also hold on real tight to the hand rail!! What trick do Norm and the others use. Chris - I can go up stairs normally, going down use the trick that Norm and others have shared. I do not sleep with it elevated, but continue to ice at least once a day. Went for another bike ride today - PT claims riding one of better exercise activities for AT rehab - low impact and builds both strength and ROM. Very nice! Can’t wait to be more active again. Hope to make similar progress by week 12. Nice Jeff. Glad to hear things are going well and thanks for the light at the end of the tunnel comment. Hopefully I can get back on my road bike in a month or so. wait at 3 months you are walking like it is nothing, are you walking up or down any steps? DO you sleep with your leg elevated. Thanks for the golf advice! I think I will do the first round in the boot just to be safe, but will surely be doing an “abbreviated” swing as well.Sorry to hear that you have joined the ATR club - best wishes for a speedy recovery! By the way, at 6 days post op, I’m surprised every day at how little pain I’ve had since injury and anticipating a speedy recovery. I’m going to Ireland in 3months to the day and don’t want to miss out on playing! …risk the drift to your toes and and force a more explosive, “jump swing” which will definitely put more pressure on that Achilles. I’m 6 days out of ATR surgery and a golf pro at a club in Boston. I play a good amount of local competitive golf, so I’ve done a lot of thinking about the injury and how the swing will work around the flawed Achilles in the last week. As long as the game doesn’t ruin your walk! Congrats Jeff! Enjoy the game. You’d be improving your mobility and recovering some ankle flexibility if you could put some ROM into your boot. As an example, Exeter’s protocol allows for 30º pf to 0º at 6 weeks (and then to 10º DF but I certainly wouldn’t recommend that you go straight there. You might want to try 5º or 10º more each week, and I guess that you might want to talk to your doctor first… You have a good boot - use it well. Taking it off at night I hope? As far as I know the Vaco boot has just the 2 soles, so easy-peasy really, with the wedge being suggested for settings from 10º pf to 30º pf. I seem to remember moving to the flatter sole at 15º but then I was on a go-faster schedule! I had an earlier, pre-Vaco version of a ROM boot (and an AirCast for the first 7 weeks of ATR #2 rehab), and I don’t recall any problems walking right after angle changes. The simpler older boots don’t have the Vaco’s multiple soles, which may introduce some complexity, I’m no Vaco expert. And around week 7 of ATR #2 rehab (and much later in ATR #1, post-op with a super-conservative OS), I started letting the boot hinge from my basic angle down to pretty extreme equinus = plantarflexed (as far as my ankle would flex), which gradually increased my walking speed until I was the fastest walker in my gang of friends! Love mine…made PWB with the crutches much easier. Doc saw my evenup at my followup yesterday and he loved it. He wrote the info down and i shared with him how to order one. Raved about mine to him. To those that read this…get one, get one, get one! I imagine those first few steps felt fantastic. Great job! IIRC, RyanB wrote that he evened up his gait just by bending his booted knee. Not for me, but you may be able to make it work. Perils include hurting your back, knees, hips, etc., OR learning a new way to walk that you have to unlearn (maybe with PT help) later. Tennis is what got me here…when I’m back, I’m back in the saddle. Horses seem like a better bet than the court:) I had the cast on for 2 1/2 weeks, boot will be on for four this week. The lifts are out but I’m not able to walk without the crutches yet. Boy oh boy, I can’t wait for that. They said I could be in the boot up to 12 weeks. Or possibly shorter…I guess it all depends on the healing. I’ll know more when I see the doc on Thurs for my 1 month check since I got the boot. Love the tumbling in mud story! How could you do anything else but laugh? Not hitting your freshly repaired leg was all that really mattered. Especially after you had to wait all that time to finally get it fixed. I’m right with Norm as well - ATR became my #1 fear many years ago when a few of my father’s tennis friends did it playing in their game. I filled in for them and heard the stories and timelines for recovery. I actively ski & bike much like yourself as well as do high impact plyometric workouts, TRX one legged strengthening, balancing etc., but playing competitive tennis twice a week is my true love and something that I want to do well into my 80’s like my father still does. This is where I most feared this injury, and I went ahead and did skiing awesome fresh tracks in CO in my tight ski boots! That’s a great out look! No doubt you will have a successful recovery with that kind of attitude. For an ATR (unlike say a head! ), tennis is way scarier than cycling or skiing. And the better the traction, the scarier! Sounds like the new non-op cures didn’t get a full and fair presentation, but that’s still very common, especially in the States. Check them out if you’re unlucky enough to join me in the “both sides now” club. And huge congregations on having the inner calm to manage that roll into the mud puddle, instead of instinctively “saving yourself” with your post-op foot! Very few of us ever pulled off that move, though most of us got a chance! jeffk58’s AchillesBlog is proudly powered by WordPress and WPDesigner..